This issue consists of two very different halves. The first half of the book is devoted to Daredevil dealing with 1) an angry mob of freed slaves, 2) the now mostly incapacitated Coyote and 3) the Spot, whom Daredevil manages to free from the strange contraption he was hooked up to. 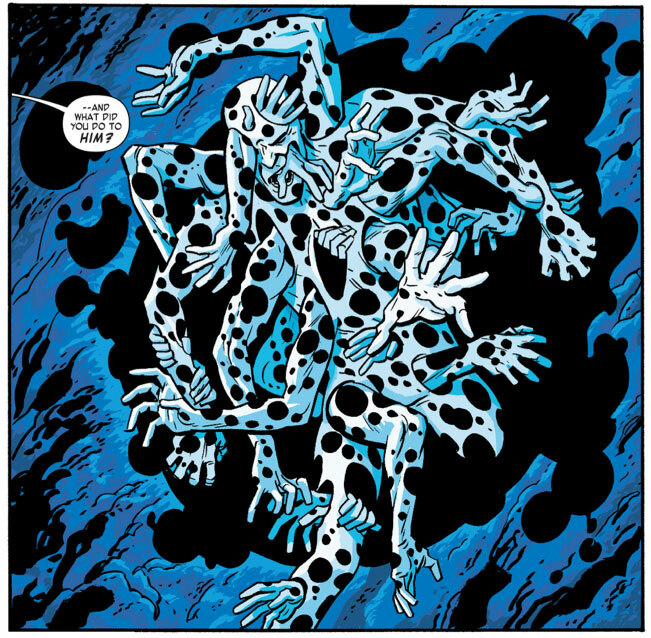 Chris Samnee draws a very creepy-looking “New Spot” with arms and legs sticking out everywhere (see below, and oh, love Javíer Rodríguez’s icy blue palette in these scenes!). Spot, scary? You betcha! The second half of the issue moves a number of pieces around and everyone who has been complaining that Mark Waid swept the slate clean when he took over the title and has been disregarding continuity ever since, well… You owe the guy an apology. This issue ends up referencing past deeds and relationships that should prove once and for all that these creators know what they’re doing. First off, there’s a longish scene with Matt and Foggy that is ripe with tension and ends in a complete role reversal for the two. I know there are readers who don’t exactly love superhero comics that feature page after page of characters (out of costume!) talking to each other. My first response to those people would be: “What are you, twelve?” and my second would be to point out that this is certainly no “talking heads” scene. Chris Samnee once again showcases his knack for getting each character to speak volumes, beyond their words, through his excellent control of posture, facial expression and perspective. All in all, a great issue by everyone involved! There’s only one problem: We’ll have to wait a month for the next issue. That one always gets to me. I can’t wait to see what this team will bring to the table in 2013. Hi Christine, nice review. I was wondering if you had any theories on who the two shadowy figures were who sent Coyote after Matt? 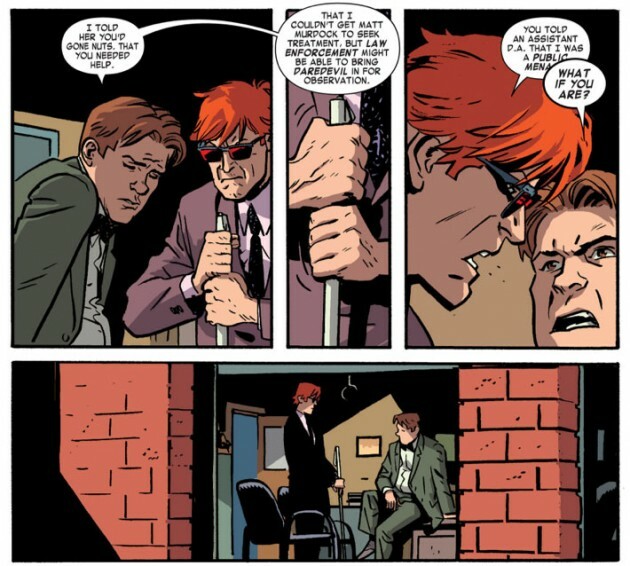 Another great issue with a Creepy-looking Spot and excellent conversation scenes with Matt and Foggy. Knowing the secret now about Superior Spider-Man, I’m really excited to see how DD handles this situation as well.